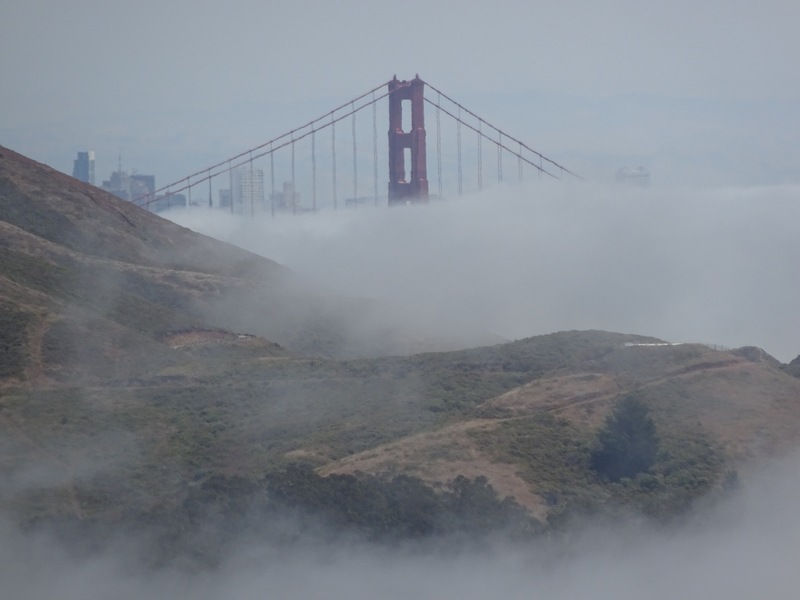 There are several trails near the Golden Gate Bridge that even long-time residents, let alone visitors to the Bay Area, have seldom or never trod. I’ve written about them in previous posts about the Pacific Overlook Batteries to Bluff Trail and hiking from the Golden Gate Bridge to Rodeo Beach. 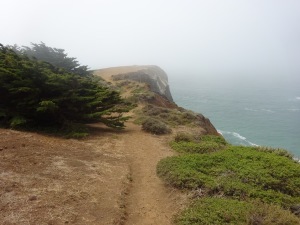 Some take a few miles more to get to by bike and car, like the one down to Black Sands Beach, and the Marin Headlands Coastal Trail near Rodeo Beach, which I walked for the first time in late July. 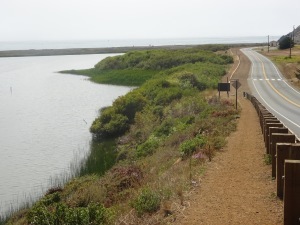 Coastal view near the beginning of the Coastal Trail. Here’s one perk that Bay Area residents will appreciate straight off: parking is easy in the lot or on the road near the trail entrance at the north end of Rodeo Beach, at least on a weekday. (It’s not hard to bike there if you’re in good shape, but it’s hard to park your bike there; a note on that at the end of this post.) The trail is pretty well marked and doesn’t require any special gear or footwear. 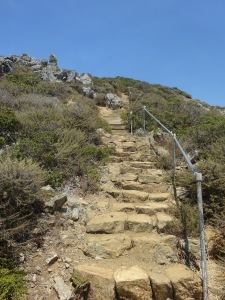 It is pretty steep in parts, so it’s not recommended if you’re not in decent shape or have knee/leg problems. 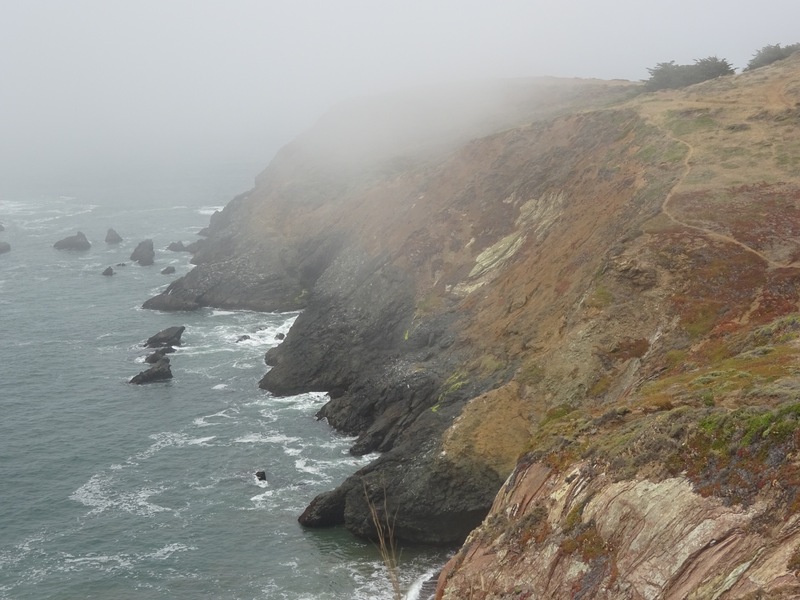 Outcropping near the end of the branch of the Coastal Trail that runs near the water. 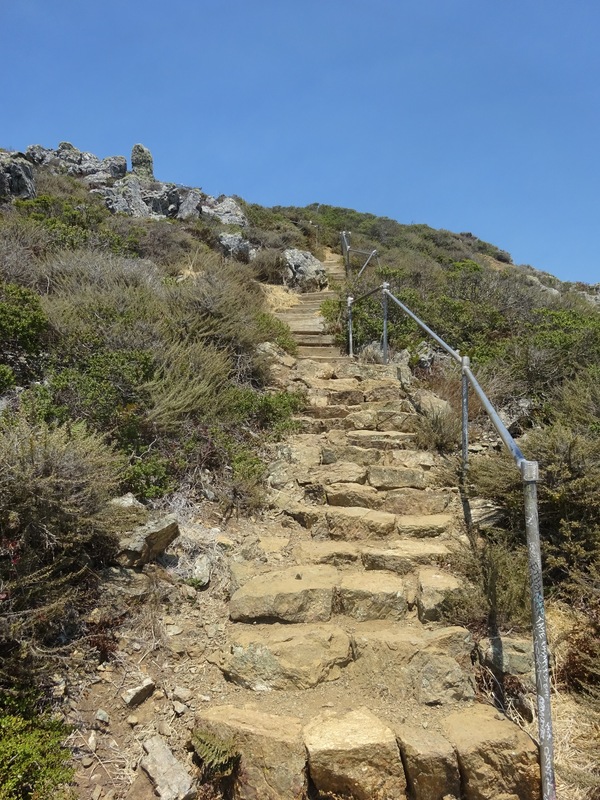 Steep stairs leading up to the highest point on the Coastal Trail. Fog-shrouded top of Golden Gate bridge, with Marin Headlands in foreground. 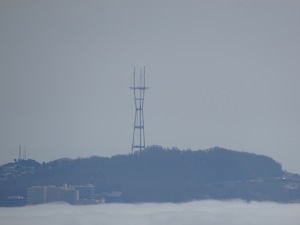 Sutro Tower in San Francisco, seen from the Coastal Trail, with the bay blanketed in fog. 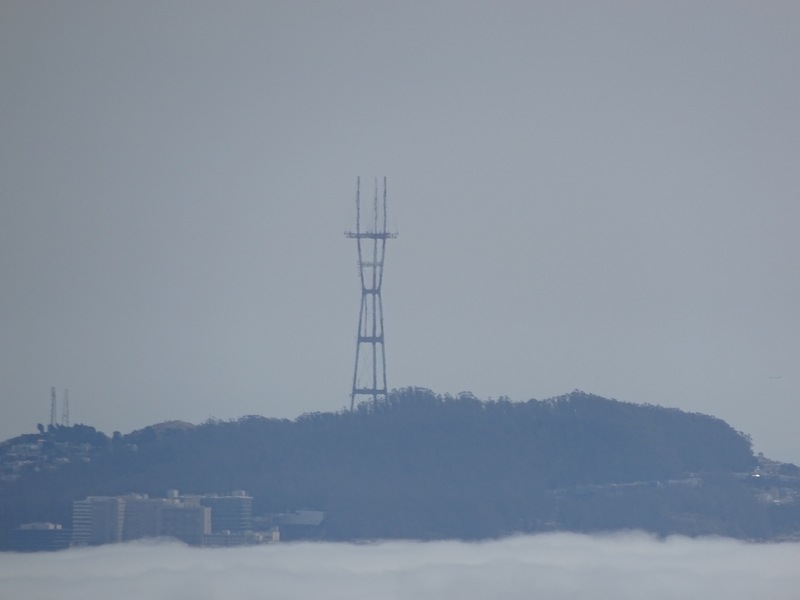 Yes, it was a foggy day on the bay when I went. 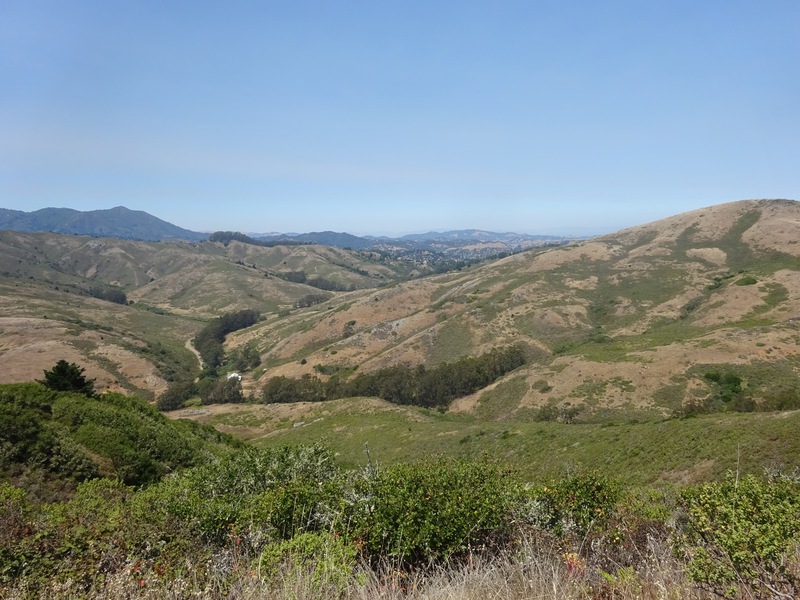 The pictures are a bit deceptive, though, because though there’s lots of fog down yonder, it was actually pretty comfortable and sunny on the trail – breezy and in the low-to-mid seventies. 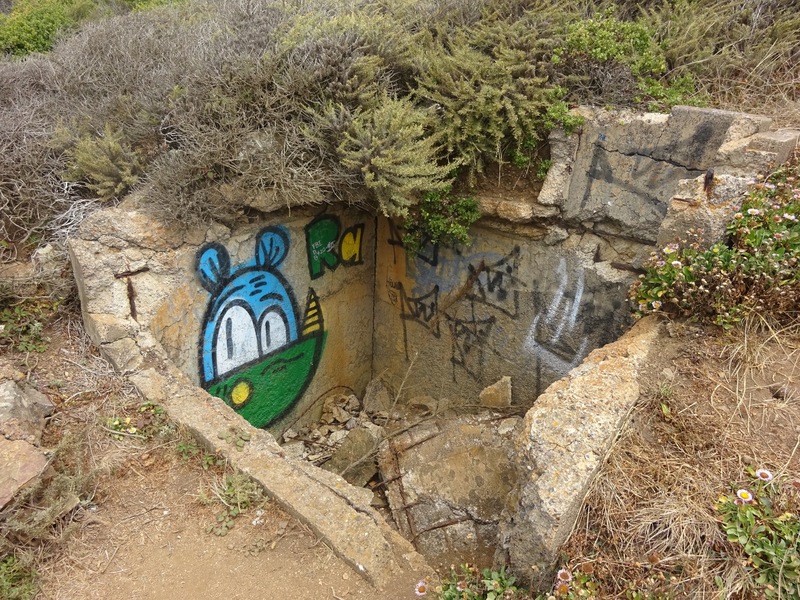 Strange graffiti on strange shelter-like pit on the trail. 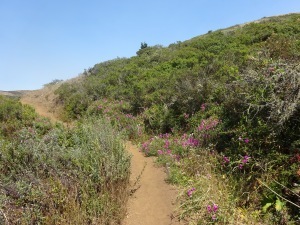 Not long after you take the trail past this spot, you have the option on continuing on the official Coastal Trail – which actually isn’t that near the coast for much of the way – or bearing right a bit to go on the Wolf Ridge Trail, which after 0.7 miles hits the Miwok Trail, which will take you back to the parking lot. Not immediately, by any means: it’s almost two and a half miles from the Coastal/Wolf Ridge intersection. One day I want to walk the Coastal Trail to Muir Beach, but you probably need to coordinate with two cars (one parked at either end) to do that, especially as there isn’t bus service back from Muir Beach. 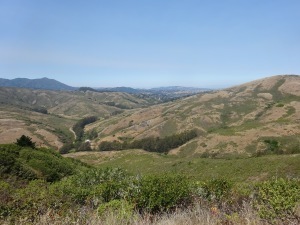 Mountainous vista near the intersection of the Coastal Trail and the Wolf Ridge Trail. Foliage on brief uphill section on the way down. If you have a car, getting to Rodeo Beach is easy enough. 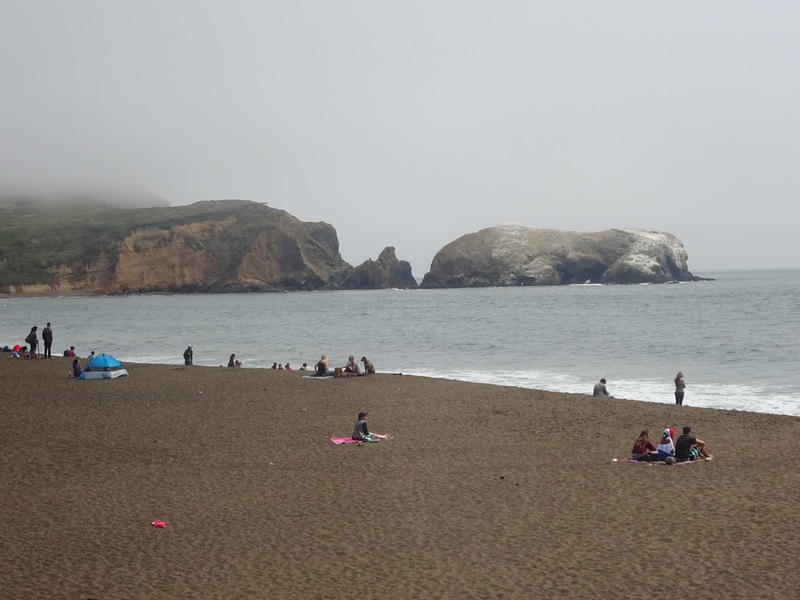 It’s possible by bus, but your options are limited – San Francisco’s MUNI runs a #76 bus to the beach, but only on Sundays and holidays. It’s not too hard to bike there (though some hills are inevitable no matter where you’re coming from), but it’s disappointing there are no bike racks in the vicinity of the beach or trail entrance. A park ranger told me I wouldn’t have a problem if I locked my bike up to any structure that wouldn’t intrude on public facilities, but unless you have a big chain, a U-lock will be difficult or impossible to put around the stationary poles/fences/railings. There’s a visitor center almost a mile away that has bike racks, but that adds a lot to a walk that’s rather long as it is.